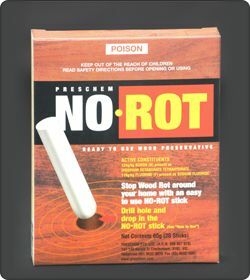 NO-ROT is a unique solid wood preservative used for the internal treatment of timber. It will stop and prevent dry rot and white ant attack. It is a concentrated mix of fungicide and insecticide, in a convenient controlled release, small chalk like stick. NO-ROT can be used as a timber treatment for all outdoor timber structures which are exposed to weather or the ingress of moisture is an issue. Typical uses are to treat pergolas, timber decks, steps, fence posts and railing, window frames, etc. It can also be used as an internal timber treatment where it’s subjected to persistent moisture, such as in bathroom wall cavities. Timber which has existing decay can also be treated with NO-ROT, to sterilise the timber and prevent further attack. All timber species can be treated. NO-ROT will only be activated in the timber with a moisture content greater than 20%. Timber treated in this situation will also resist termite attack. Drill one or two 9 mm (3/8 inch) hole 40 mm (1 3/4 inch) into the timber at the position where decay commonly occurs. Insert one NO-ROT into each hole and seal holes with the wooden dowels supplied. Under normal conditions the sticks should be replaced every 5-10 years. The NO-ROT wood preservative can be found in many hardware stores such as Masters Home Improvement, Mitre 10, Home Hardware, Thrifty Link. For a fill list of stockists visit our stockist page. Store in a cool dry place in the original PVC container and out of the reach of children. NO-ROT sticks have an indefinite shelf life. If poisoning occurs, contact Doctor or Poisons Information Centre (13 11 26). Is swallowed drink water or milk. Seek immediate medical addention. If in eyes, hold eyes open flood with water for at least 15 minutes and see a Doctor.